Not to be confused with the lung disease caused by asbestos, asbestosis. For other uses, see Asbestos (disambiguation). Asbestos is a set of six naturally occurring silicate minerals, which all have in common their asbestiform habit: i.e., long (roughly 1:20 aspect ratio), thin fibrous crystals, with each visible fiber composed of millions of microscopic "fibrils" that can be released by abrasion and other processes. The minerals are chrysotile, amosite, crocidolite, tremolite, anthophyllite, and actinolite. 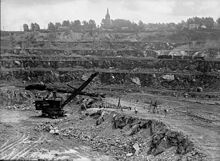 Asbestos has been mined for over 4,000 years, but large-scale mining began at the end of the 19th century, when manufacturers and builders began using asbestos for its desirable physical properties. Some of those properties are sound absorption, average tensile strength, affordability, and resistance to fire, heat, and electricity. It was used in such applications as electrical insulation for hotplate wiring and in building insulation. When asbestos is used for its resistance to fire or heat, the fibers are often mixed with cement or woven into fabric or mats. These desirable properties led to asbestos being used very widely until the late 20th century. Inhalation of asbestos fibers can cause serious and fatal illnesses including lung cancer, mesothelioma, and asbestosis (a type of pneumoconiosis). Asbestos is currently estimated to cause 255,000 deaths per year. Concern for asbestos-related illness began in the 20th century and escalated during the 1920s and 1930s. By the 1980s and 1990s, asbestos trade and use were heavily restricted, phased out, or banned outright in an increasing number of countries. Many developing countries still support the use of asbestos as a building material, and mining of asbestos is ongoing, with the top producer Russia producing around one million metric tonnes in 2015. Despite the severity of asbestos-related diseases, the material has extremely widespread use in many areas. Continuing long-term use of asbestos after harmful health effects were known or suspected, and the slow emergence of symptoms decades after exposure ceased, made asbestos litigation the longest, most expensive mass tort in U.S. history though a much lesser legal issue in most other countries involved. Asbestos-related liability also remains an ongoing concern for many manufacturers, insurers and reinsurers. The word "asbestos", first used in the 1600s, ultimately derives from the Ancient Greek ἄσβεστος, meaning “unquenchable” or “inextinguishable”. The name reflects use of the substance for wicks that would never burn up. It was adopted via the Old French abestos, which in turn got the word from Greek via Latin, but in the original Greek, it actually referred to quicklime. It is said by the Oxford English Dictionary to have been wrongly used by Pliny for asbestos, who popularized the misnomer. Asbestos was referred to in Greek as amiantos, meaning "undefiled", because it was not marked when thrown into a fire. This is the source for the word for asbestos in many languages, such as the Portuguese amianto. It had also been called "amiant" in English in the early 15th century, but this usage was superseded by "asbestos". The word is pronounced /æsˈbɛstəs/ or /æsˈbɛstɒs/. People have used asbestos for thousands of years to create flexible objects, such as napkins, that resist fire. In the modern era, companies began producing asbestos consumer goods on an industrial scale. Now people recognize the health hazard that asbestos poses, and it is banned or strictly regulated around the world. Asbestos use dates back at least 4,500 years, when the inhabitants of the Lake Juojärvi region in East Finland strengthened earthenware pots and cooking utensils with the asbestos mineral anthophyllite (see Asbestos-ceramic). One of the first descriptions of a material that may have been asbestos is in Theophrastus, On Stones, from around 300 BC, although this identification has been questioned. In both modern and ancient Greek, the usual name for the material known in English as "asbestos" is amiantos ("undefiled", "pure"), which was adapted into the French as amiante and into Spanish and Portuguese as amianto. In modern Greek, the word ἀσβεστος or ασβέστης stands consistently and solely for lime. The term asbestos is traceable to Roman naturalist Pliny the Elder's manuscript Natural History, and his use of the term asbestinon, meaning "unquenchable". While Pliny or his nephew Pliny the Younger is popularly credited with recognising the detrimental effects of asbestos on human beings, examination of the primary sources reveals no support for either claim. Wealthy Persians amazed guests by cleaning a cloth by exposing it to fire. For example, according to Tabari, one of the curious items belonging to Khosrow II Parviz, the great Sassanian king (r. 531–579), was a napkin (Persian: منديل‎) that he cleaned simply by throwing it into fire. Such cloth is believed to have been made of asbestos imported over the Hindu Kush. According to Biruni in his book, Gems, any cloths made of asbestos (Persian: آذرشست‎, āzarshost) were called shostakeh (Persian: شستكه‎). Some Persians believed the fiber was the fur of an animal, called the samandar (Persian: سمندر‎), which lived in fire and died when exposed to water, which was where the former belief that the salamander could tolerate fire originated. Charlemagne, the first Holy Roman Emperor (800–814), is said to have had a tablecloth made of asbestos. Marco Polo recounts having been shown, in a place he calls Ghinghin talas, "a good vein from which the cloth which we call of salamander, which cannot be burnt if it is thrown into the fire, is made ..."
Industrial scale asbestos mining began in 1878 in Thetford township, Quebec. 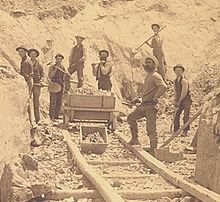 By 1895, mining was increasingly mechanized. The large-scale asbestos industry began in the mid-19th century. Early attempts at producing asbestos paper and cloth in Italy began in the 1850s, but were unsuccessful in creating a market for such products. Canadian samples of asbestos were displayed in London in 1862, and the first companies were formed in England and Scotland to exploit this resource. Asbestos was first used in the manufacture of yarn, and German industrialist Louis Wertheim adopted this process in his factories in Germany. In 1871, the Patent Asbestos Manufacturing Company was established in Glasgow, and during the following decades, the Clydebank area became a centre for the nascent industry. Industrial-scale mining began in the Thetford hills, Quebec, from the 1870s. Sir William Edmond Logan was the first to notice the large deposits of chrysotile in the hills in his capacity as head of Geological Survey of Canada. Samples of the minerals from here were displayed in London, and excited much interest. With the opening up of the Quebec Central Railway in 1876, mining entrepreneurs such as Andrew Stuart Johnson established the asbestos industry in the province. The 50 ton output of the mines in 1878 rose to over 10,000 tons in the 1890s with the adoption of machine technologies and expanded production. For a long time, the world's largest asbestos mine was the Jeffrey mine in the town of Asbestos, Quebec. Asbestos production began in the Urals of the Russian Empire in the 1880s, and in the Alpine regions of Northern Italy with the formation in Turin of the Italo-English Pure Asbestos Company in 1876, although this was soon swamped by the greater production levels from the Canadian mines. Mining also took off in South Africa from 1893 under the aegis of the British businessman Francis Oates, the Director of the De Beers company. It was in South Africa that the production of amosite began in 1910. The U.S. asbestos industry had an early start in 1858, when fibrous anthophyllite was mined for use as asbestos insulation by the Johns Company, a predecessor to the current Johns Manville, at a quarry at Ward's Hill on Staten Island, New York. US production began in earnest in 1899, with the discovery of large deposits in the Belvidere Mountain. The use of asbestos became increasingly widespread towards the end of the 19th century, when its diverse applications included fire-retardant coatings, concrete, bricks, pipes and fireplace cement, heat-, fire-, and acid-resistant gaskets, pipe insulation, ceiling insulation, fireproof drywall, flooring, roofing, lawn furniture, and drywall joint compound. In 2011 it was reported that over 50% of UK houses still contained asbestos, despite a ban on asbestos products some years earlier. In Japan, particularly after World War II, asbestos was used in the manufacture of ammonium sulfate for purposes of rice production, sprayed upon the ceilings, iron skeletons, and walls of railroad cars and buildings (during the 1960s), and used for energy efficiency reasons as well. Production of asbestos in Japan peaked in 1974 and went through ups and downs until about 1990, when production began to drop dramatically. For additional chronological citations, see List of asbestos disease medical articles. In 1899, Montague Murray noted the negative health effects of asbestos. The first documented death related to asbestos was in 1906. In the early 1900s researchers began to notice a large number of early deaths and lung problems in asbestos-mining towns. The first such study was conducted by H. Montague Murray at the Charing Cross Hospital, London, in 1900, in which a postmortem investigation of a young man who had died from pulmonary fibrosis after having worked for 14 years in an asbestos textile factory, discovered asbestos traces in the victim's lungs. Adelaide Anderson, the Inspector of Factories in Britain, included asbestos in a list of harmful industrial substances in 1902. Similar investigations were conducted in France and Italy, in 1906 and 1908, respectively. The first diagnosis of asbestosis was made in the UK in 1924. Nellie Kershaw was employed at Turner Brothers Asbestos in Rochdale,Greater Manchester, England from 1917, spinning raw asbestos fibre into yarn. Her death in 1924 led to a formal inquest. Pathologist William Edmund Cooke testified that his examination of the lungs indicated old scarring indicative of a previous, healed, tuberculosis infection, and extensive fibrosis, in which were visible "particles of mineral matter ... of various shapes, but the large majority have sharp angles." Having compared these particles with samples of asbestos dust provided by S. A. Henry, His Majesty's Medical Inspector of Factories, Cooke concluded that they "originated from asbestos and were, beyond a reasonable doubt, the primary cause of the fibrosis of the lungs and therefore of death". As a result of Cooke's paper, parliament commissioned an inquiry into the effects of asbestos dust by E. R. A. Merewether, Medical Inspector of Factories, and C. W. Price, a factory inspector and pioneer of dust monitoring and control. Their subsequent report, Occurrence of Pulmonary Fibrosis & Other Pulmonary Affections in Asbestos Workers, was presented to parliament on 24 March 1930. It concluded that the development of asbestosis was irrefutably linked to the prolonged inhalation of asbestos dust, and included the first health study of asbestos workers, which found that 66% of those employed for 20 years or more suffered from asbestosis. The report led to the publication of the first Asbestos Industry Regulations in 1931, which came into effect on 1 March 1932. These regulated ventilation and made asbestosis an excusable work-related disease. 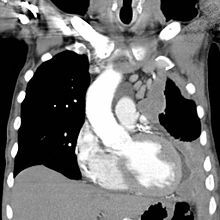 The term mesothelioma was first used in medical literature in 1931; its association with asbestos was first noted sometime in the 1940s. Similar legislation followed in the U.S. about ten years later. Approximately 100,000 people in the United States have died, or are terminally ill, from asbestos exposure related to ship building. In the Hampton Roads area, a shipbuilding center, mesothelioma occurrence is seven times the national rate. Thousands of tons of asbestos were used in World War II ships to insulate piping, boilers, steam engines, and steam turbines. 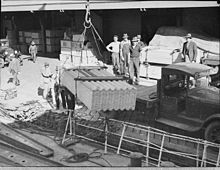 There were approximately 4.3 million shipyard workers in the United States during WWII; for every 1,000 workers about 14 died of mesothelioma and an unknown number died from asbestosis. The United States government and asbestos industry have been criticized for not acting quickly enough to inform the public of dangers, and to reduce public exposure. In the late 1970s, court documents proved that asbestos industry officials knew of asbestos dangers since the 1930s and had concealed them from the public. In Australia, asbestos was widely used in construction and other industries between 1946 and 1980. From the 1970s there was increasing concern about the dangers of asbestos, and its use was phased out. Mining ceased in 1983. The use of asbestos was phased out in 1989 and banned entirely in December 2003. The dangers of asbestos are now well known in Australia and there is help and support for sufferers from asbestosis or mesothelioma. Example of asbestos cement siding and lining on a post-war temporary house in Yardley. Nearly 40,000 of these structures were built between 1946 and 1949 to house families. In the European Union and Australia it has been banned as a potential health hazard and is not used at all. Japan is moving in the same direction, but at a slower pace. Thermal and chemical insulation (e.g., fire rated doors, limpet spray, lagging and gaskets). Cigarette manufacturer Lorillard (Kent's filtered cigarette) used crocidolite asbestos in its "Micronite" filter from 1952 to 1956. While mostly chrysotile asbestos fibers were once used in automobile brake pads, shoes, and clutch discs, contaminants of amphiboles were present. Since approximately the mid-1990s, brake pads, new or replacement, have been manufactured instead with linings made of ceramic, carbon, metallic and aramid fiber (Twaron or Kevlar—the same material used in bulletproof vests). Artificial Christmas snow, known as flocking, was previously made with asbestos. It was used as an effect in films including The Wizard of Oz and department store window displays and it was marketed for use in private homes under brand names that included "Pure White", "Snow Drift" and "White Magic". Older decorative ceilings, similar to this one, may contain small amounts of white asbestos. 1929 newspaper advertisement from Perth, Western Australia, for asbestos sheeting for residential building construction. The use of asbestos in new construction projects has been banned for health and safety reasons in many developed countries or regions, including the European Union, Australia, Hong Kong, Japan, and New Zealand. A notable exception is the United States, where asbestos continues to be used in construction such as cement asbestos pipes. The 5th Circuit Court prevented the EPA from banning asbestos in 1991 because EPA research showed the ban would cost between $450 and 800 million while only saving around 200 lives in a 13-year timeframe, and that the EPA did not provide adequate evidence for the safety of alternative products. Until the mid-1980s, small amounts of white asbestos were used in the manufacture of Artex, a decorative stipple finish, however, some of the lesser-known suppliers of Artex were still adding white asbestos until 1999. Prior to the ban, asbestos was widely used in the construction industry in thousands of materials. Some are judged to be more dangerous than others due to the amount of asbestos and the material's friable nature. Sprayed coatings, pipe insulation and Asbestos Insulating Board (AIB) are thought to be the most dangerous due to their high content of asbestos and friable nature. Many older buildings built before the late 1990s contain asbestos. In the United States, there is a minimum standard for asbestos surveys as described by ASTM Standard E 2356–04. In the UK the Health and Safety Executive have issued guidance called HSG264 describing how surveys should be completed although other methods can be used if they can demonstrate they have met the regulations by other means. The U.S. Environmental Protection Agency includes some but not all asbestos-contaminated facilities on the Superfund National Priorities list (NPL). Renovation and demolition of asbestos-contaminated buildings is subject to EPA NESHAP and OSHA Regulations. Asbestos is not a material covered under CERCLA's innocent purchaser defense. In the UK, the removal and disposal of asbestos and of substances containing it are covered by the Control of Asbestos Regulations 2006. U.S. asbestos consumption hit a peak of 804,000 tons in 1973; world asbestos demand peaked around 1977, with 25 countries producing nearly 4.8 million metric tons annually. In older buildings (e.g. those built prior to 1999 in the UK, before white asbestos was banned), asbestos may still be present in some areas. Being aware of asbestos locations reduces the risk of disturbing asbestos. Removal of asbestos building components can also remove the fire protection they provide, therefore fire protection substitutes are required for proper fire protection that the asbestos originally provided. Some countries, such as India, Indonesia, China, Russia and Brazil, have continued widespread use of asbestos. The most common is corrugated asbestos-cement sheets or "A/C sheets" for roofing and for side walls. Millions of homes, factories, schools or sheds and shelters continue to use asbestos. Cutting these sheets to size and drilling holes to receive 'J' bolts to help secure the sheets to roof framing is done on-site. There has been no significant change in production and use of A/C sheets in developing countries following the widespread restrictions in developed nations. As New York City's World Trade Center collapsed following the September 11 attacks, Lower Manhattan was blanketed in a mixture of building debris and combustible materials. This complex mixture gave rise to the concern that thousands of residents and workers in the area would be exposed to known hazards in the air and in the dust, such as asbestos, lead, glass fibers, and pulverized concrete. More than 1,000 tons of asbestos are thought to have been released into the air following the buildings' destruction. Inhalation of a mixture of asbestos and other toxicants is thought to be linked to the unusually high death rate from cancer of emergency service workers since the disaster. Thousands more are now thought to be at risk of developing cancer due to this exposure with those who have died so far being only the "tip of the iceberg". Some commentators have criticised authorities for using asbestos in the buildings' construction. In May 2002, after numerous cleanup, dust collection, and air monitoring activities were conducted outdoors by EPA, other federal agencies, New York City, and the state of New York, New York City formally requested federal assistance to clean and test residences in the vicinity of the World Trade Center site for airborne asbestos. Vermiculite is a hydrated laminar magnesium-aluminum-iron silicate which resembles mica. It can be used for many industrial applications and has been used as insulation. Some deposits of vermiculite have been found to be contaminated with small amounts of asbestos. One vermiculite mine operated by W. R. Grace and Company in Libby, Montana exposed workers and community residents to danger by mining vermiculite contaminated with asbestos, typically richterite, winchite, actinolite or tremolite. Vermiculite contaminated with asbestos from the Libby mine was used as insulation in residential and commercial buildings through Canada and the United States. W. R. Grace and Company's loose-fill vermiculite was marketed as Zonolite but was also used in sprayed-on products such as Monokote. In 1999 the EPA began cleanup efforts in Libby and now the area is a Superfund cleanup area. The EPA has determined that harmful asbestos is released from the mine as well as through other activities that disturb soil in the area. 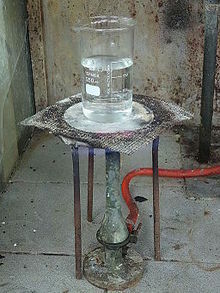 A laboratory heat spreader made of asbestos, on tripod over a Teclu burner. Talc can sometimes be contaminated with asbestos due to the proximity of asbestos ore (usually tremolite) in underground talc deposits. By 1973, US federal law required all talc products to be asbestos-free, and today there is strict quality control in the production of talc products, separating cosmetic-grade talc (e.g. talcum powder) from industrial-grade talc (often used in friction products) has largely eliminated this issue for consumers. In 2000, tests in a certified asbestos-testing laboratory found the tremolite form of amphibole asbestos used to be found in three out of eight popular brands of children's crayons that were made partly from talc: Crayola, Prang, and RoseArt. In Crayola crayons, the tests found asbestos levels around 0.05% in Carnation Pink and 2.86% in Orchid; in Prang crayons, the range was from 0.3% in Periwinkle to 0.54% in Yellow; in Rose Art crayons, it was from 0.03% in Brown to 1.20% in Orange. Overall, 32 different types of crayons from these brands used to contain more than trace amounts of asbestos, and eight others contained trace amounts. The Art and Creative Materials Institute, a trade association which tested the safety of crayons on behalf of the makers, initially insisted the test results must have been incorrect, although they later said they do not test for asbestos. In May 2000, Crayola said tests by Richard Lee, a materials analyst whose testimony on behalf of the asbestos industry has been accepted in lawsuits over 250 times, found its crayons tested negative for asbestos. In spite of that, in June 2000 Binney & Smith, the maker of Crayola, and the other makers agreed to stop using talc in their products, and changed their product formulations in the United States. On July 12, 2018, a Missouri jury ordered Johnson & Johnson to pay a record $4.69 billion to 22 women who alleged the company’s talc-based products, including its baby powder, contain asbestos and caused them to develop ovarian cancer. Six mineral types are defined by the United States Environmental Protection Agency (EPA) as "asbestos" including those belonging to the serpentine class and those belonging to the amphibole class. All six asbestos mineral types are known to be human carcinogens. The visible fibers are themselves each composed of millions of microscopic "fibrils" that can be released by abrasion and other processes. Blue asbestos (crocidolite). The ruler is 1 cm. Chrysotile, CAS No. 12001-29-5, is obtained from serpentinite rocks which are common throughout the world. Its idealized chemical formula is Mg3(Si2O5)(OH)4. Chrysotile appears under the microscope as a white fiber. Chrysotile has been used more than any other type and accounts for about 95% of the asbestos found in buildings in America. Chrysotile is more flexible than amphibole types of asbestos, and can be spun and woven into fabric. The most common use was corrugated asbestos cement roofing primarily for outbuildings, warehouses and garages. It may also be found in sheets or panels used for ceilings and sometimes for walls and floors. Chrysotile has been a component in joint compound and some plasters. Numerous other items have been made containing chrysotile including brake linings, fire barriers in fuseboxes, pipe insulation, floor tiles, residential shingles, and gaskets for high temperature equipment. Amphibole class fibers are needle-like. Amosite, crocidolite, tremolite, anthophyllite and actinolite are members of the amphibole class. Amosite, CAS No. 12172-73-5, often referred to as brown asbestos, is a trade name for the amphiboles belonging to the cummingtonite-grunerite solid solution series, commonly from South Africa, named as a partial acronym for "Asbestos Mines of South Africa". One formula given for amosite is Fe7Si8O22(OH)2. Amosite is seen under a microscope as a grey-white vitreous fiber. It is found most frequently as a fire retardant in thermal insulation products, asbestos insulating board and ceiling tiles. 2Si8O22(OH)2. Crocidolite is seen under a microscope as a blue fiber. Crocidolite commonly occurs as soft friable fibers. Asbestiform amphibole may also occur as soft friable fibers but some varieties such as amosite are commonly straighter. All forms of asbestos are fibrillar in that they are composed of fibers with breadths less than 1 micrometer in bundles of very great widths. 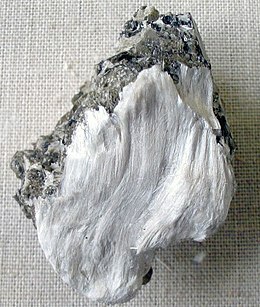 Asbestos with particularly fine fibers is also referred to as "amianthus". Other regulated asbestos minerals, such as tremolite asbestos, CAS No. 77536-68-6, Ca2Mg5Si8O22(OH)2; actinolite asbestos, CAS No. 77536-66-4, Ca2(Mg,FeII)5(Si8O22)(OH)2; and anthophyllite asbestos, CAS No. 77536-67-5, (Mg,FeII)7Si8O22(OH)2; are less commonly used industrially but can still be found in a variety of construction materials and insulation materials and have been used in a few consumer products. Other natural asbestiform minerals, such as richterite, Na(CaNa)(Mg,FeII)5(Si8O22)(OH)2, and winchite, (CaNa)Mg4(Al,FeIII)(Si8O22)(OH)2, though not regulated, are said by some to be no less harmful than tremolite, amosite, or crocidolite. They are termed "asbestiform" rather than asbestos. Although the U.S. Occupational Safety and Health Administration (OSHA) has not included them in the asbestos standard, NIOSH and the American Thoracic Society have recommended them for inclusion as regulated materials because they may also be hazardous to health. World production of asbestos (metric tons) from 1900 to the present, also including a trend line. In 2017, 1.3 million tonnes of asbestos was mined worldwide. Russia was the largest producer with 53% of the world total, followed by Kazakhstan (16%), China (15%), and Brazil (11.5%). Asia consumes some 70% of the asbestos produced in the world with China, India and Indonesia the largest consumers. All types of asbestos fibers are known to cause serious health hazards in humans. Amosite and crocidolite are considered the most hazardous asbestos fiber types; however, chrysotile asbestos has also produced tumors in animals and is a recognized cause of asbestosis and malignant mesothelioma in humans, and mesothelioma has been observed in people who were occupationally exposed to chrysotile, family members of the occupationally exposed, and residents who lived close to asbestos factories and mines. During the 1980s and again in the 1990s it was suggested at times that the process of making asbestos cement could "neutralize" the asbestos, either via chemical processes or by causing cement to attach to the fibers and changing their physical size; subsequent studies showed that this was untrue, and that decades-old asbestos cement, when broken, releases asbestos fibers identical to those found in nature, with no detectable alteration. Researcher using a fiber length classifier to produce length-selected fibers of asbestos for toxological studies. The United States remains one of the few developed countries to not ban asbestos which is legal and still widely used in such commonly used products as clothing, pipeline wraps, vinyl floor tiles, millboards, cement pipes, disk brake pads, gaskets and roof coatings. In 1989 the EPA issued the Asbestos Ban and Phase Out Rule but in 1991, asbestos industry supporters challenged and overturned the ban in a landmark lawsuit: Corrosion Proof Fittings v. the Environmental Protection Agency. Although the case resulted in several small victories for asbestos regulation, the EPA ultimately did not put an end to asbestos use. This ruling leaves many consumer products that can still legally contain trace amounts of asbestos. For a clarification of products which legally contain asbestos, read the EPA's clarification statement. In 2010, Washington State banned asbestos in automotive brakes starting in 2014. The Occupational Safety and Health Administration (OSHA), has set limits of 100,000 fibers with lengths greater than or equal to 5 µm per cubic meter of workplace air for eight-hour shifts and 40-hour work weeks. In Vietnam, asbestos is not banned and still widely used. Vietnam is one of the top 10 asbestos users in the world with an annual import volume of about 65,000-70,000 tons of chrysotile. About 90% of the imported asbestos is used to produce about 100 million m2 of roofing sheets of cement-roofing (asbestos-cement). According to one study, among 300 families in Yen Bai, Thanh Hoa, 85% of households use asbestos roofing sheets, however, only 5% know about their harms. However, in the project of adjusting the master plan for construction materials development to 2020 with orientation to 2030 submitted by the Ministry of Construction to the Government in January 2014 still suggests to continue using chrysotile for a long time. The use of crocidolite (blue) asbestos was banned in 1967, while the use of amosite (brown) asbestos continued in the construction industry until the mid-1980s. It was finally banned from building products in 1989, though it remained in gaskets and brake linings until 31 December 2003, and cannot be imported, used or recycled. Asbestos continues to be a problem. Two out of three homes in Australia built between World War II and the early 1980s still contain asbestos. The union that represents workers tasked with modifying electrical meter boxes at residences stated that workers should refuse to do this work until the boxes have been inspected for asbestos, and the head of the Australian Council of Trade Unions (ACTU) has called on the government to protect its citizens by ridding the country of asbestos by 2030. Handlers of asbestos materials must have a B-Class license for bonded asbestos and an A-Class license for friable asbestos. The town of Wittenoom, in Western Australia was built around a (blue) asbestos mine. The entire town continues to be contaminated, and has been disincorporated, allowing local authorities to remove references to Wittenoom from maps and roadsigns. From December 31, 2018 it was illegal to import, manufacture, sell, trade or use products made from asbestos. There are exemptions for its use in the chlor-alkali industry, the military, nuclear facilities and for magnesium extraction from asbestos mining residues. Revelations that hundreds of workers had died in Japan over the previous few decades from diseases related to asbestos sparked a scandal in mid-2005. Tokyo had, in 1971, ordered companies handling asbestos to install ventilators and check health on a regular basis; however, the Japanese government did not ban crocidolite and amosite until 1995, and a near complete ban with a few exceptions on asbestos was implemented in 2006, with the remaining exceptions being removed in March 2012 for a full-fledged ban. In 1984, the import of raw amphibole (blue and brown) asbestos into New Zealand was banned. In 2002 the import of chrysotile (white) asbestos was also banned. In 2015 the government announced that the importation of asbestos would be completely banned with very limited exceptions (expected to be applied to replacement parts for older machines) that would be reviewed on a case-by-case basis. North-west of Nelson, in the Upper Takaka Valley is New Zealand's only commercially harvested asbestos mine. A low-grade Chrysotile was mined here from 1908 to 1917 but only 100 tons was washed and taken out by packhorse. A new power scheme enabled work to renew and between 1940 and 1949, 40 tons a month was mined by the Hume Company. This continued to 1964, when, due to the short length of its fibre, the limited commercial viability forced mining to cease. In May 1997, the manufacture and use of crocidolite and amosite, commonly known as blue and brown asbestos, were fully banned in South Korea. In January 2009, a full-fledged ban on all types of asbestos occurred when the government banned the manufacture, import, sale, storage, transport or use of asbestos or any substance containing more than 0.1% of asbestos. In 2011, South Korea became the world's sixth country to enact an asbestos harm aid act, which entitles any Korean citizen to free lifetime medical care as well as monthly income from the government if he or she is diagnosed with an asbestos-related disease. In the United Kingdom, blue and brown asbestos materials were banned outright in 1985 while the import, sale and second hand reuse of white asbestos was outlawed in 1999. The 2012 Control of Asbestos Regulations state that owners of non-domestic buildings (e.g., factories and offices) have a "duty to manage" asbestos on the premises by making themselves aware of its presence and ensuring the material does not deteriorate, removing it if necessary. Employers, e.g. construction companies, whose operatives may come into contact with asbestos must also provide annual asbestos training to their workers. Fiberglass insulation was invented in 1938 and is now the most commonly used type of insulation material. The safety of this material has also been called into question due to similarities in material structure. However, the International Agency for Research on Cancer removed fiberglass from its list of possible human carcinogens in 2001 and a scientific review article from 2011 claimed epidemiology data was inconsistent and concluded that the IARC's decision to downgrade the carcinogenic potential of fiberglass was valid (however, this study was funded by sponsored research contract from the North American Insulation Manufacturer’s Association). In 1978, a highly texturized fiberglass fabric was invented by Bal Dixit, called Zetex. This fabric is lighter than asbestos, but offers the same bulk, thickness, hand, feel, and abrasion resistance as asbestos. The fiberglass was texturized to eliminate some of the problems that arise with fiberglass, such as poor abrasion resistance and poor seam strength. In Europe, mineral wool and glass wool are the main insulators in houses. Many companies that produced asbestos-cement products that were reinforced with asbestos fibers have developed products incorporating organic fibers. One such product was known as "Eternit" and another "Everite" now use "Nutec" fibers which consist of organic fibers, portland cement and silica. Cement-bonded wood fiber is another substitute. Stone fibers are used in gaskets and friction materials. Another potential fiber is polybenzimidazole or PBI fiber. Polybenzimidazole fiber is a synthetic fiber with a high melting point of 760 °C (1,400 °F) that also does not ignite. Because of its exceptional thermal and chemical stability, it is often used by fire departments and space agencies. The demolition of buildings containing large amounts of asbestos based materials pose particular problems for builders and property developers – such buildings often have to be deconstructed piece by piece, or the asbestos has to be painstakingly removed before the structure can be razed by mechanical or explosive means. One such example is the Red Road Flats in Glasgow, Scotland which used huge amounts of asbestos cement board for wall panelling – here British health and safety regulations stipulate that asbestos material has to be removed to a landfill site via an approved route at certain times of the day in specially adapted vehicles. In the United States, the EPA governs the removal and disposal of asbestos strictly. Companies that remove asbestos must comply with EPA licensing. These companies are called EPA licensed asbestos contractors. Anytime one of these asbestos contractors performs work a test consultant has to conduct strict testing to ensure the asbestos is completely removed. Asbestos can be recycled by transforming it into harmless silicate glass. A process of thermal decomposition at 1,000–1,250 °C (1,800–2,300 °F) produces a mixture of non-hazardous silicate phases, and at temperatures above 1,250 °C (2,300 °F) it produces silicate glass. Microwave thermal treatment can be used in an industrial manufacturing process to transform asbestos and asbestos-containing waste into porcelain stoneware tiles, porous single-fired wall tiles, and ceramic bricks. The combination of oxalic acid with ultrasound fully degrades chrysotile asbestos fibers. ^ a b c d e Alleman, James E.; Mossman, Brooke T (July 1997). "Asbestos Revisited" (PDF). Scientific American. 277 (1): 54–57. Bibcode:1997SciAm.277a..70A. doi:10.1038/scientificamerican0797-70. Archived from the original (PDF) on 3 June 2010. Retrieved 26 November 2010. ^ a b c d Gee, David; Greenberg, Morris (9 January 2002). "Asbestos: from 'magic' to malevolent mineral" (PDF). Late Lessons from Early Warnings: The Precautionary Principle 1896–2000. Copenhagen: EEA (22): 52–63. ISBN 978-92-9167-323-0. Retrieved 20 April 2010. ^ BrancheArbejdsmiljøRådet for Bygge & Anlæg (February 2009). Når du støder på asbest. Branchevejledning (in Danish). Copenhagen. pp. 6–7. ISBN 978-87-7952-118-6. Archived from the original on 6 January 2011. ^ Furuya, Sugio; Chimed-Ochir, Odgerel; Takahashi, Ken; David, Annette; Takala, Jukka (16 May 2018). "Global Asbestos Disaster". International Journal of Environmental Research and Public Health. 15 (5): 1000. doi:10.3390/ijerph15051000. ISSN 1660-4601. PMC 5982039. PMID 29772681. ^ "Timeline Of Asbestos Bans". Retrieved 25 September 2017. ^ Best, Richard. "Liability for Asbestos Related Disease in England and Germany" (PDF). germanlawjournal.com. Archived from the original (PDF) on 26 February 2015. Retrieved 29 July 2015. ^ a b Bostock, John (1856). "Asbestinon". The Natural History of Pliny. Vol. IV. Translated by Riley, H. T. London: Henry G. Bohn. p. 137. Retrieved 26 November 2010. ^ Shorter Oxford English Dictionary (5th ed.). Oxford University Press. 2002. ^ "asbestos | Origin and meaning of asbestos by Online Etymology Dictionary". www.etymonline.com. Retrieved 14 December 2018. ^ "asbestos". Oxford Living Dictionaries. Oxford University Press. Retrieved 21 March 2019. ^ a b Ross, Malcolm & Nolan, Robert P (2003). "History of asbestos discovery and use and asbestos-related disease in context with the occurrence of asbestos within the ophiolite complexes". In Dilek, Yildirim & Newcomb, Sally (eds.). Ophiolite Concept and the Evolution of Geological Thought. Special Paper 373. Boulder, Colorado: Geological Society of America. ISBN 978-0-8137-2373-0. ^ Caley, Earl R.; Richards, John F. C. (1956). "Commentary". Theophrastus on Stones: Introduction, Greek Text, English Translation, and Commentary. Graduate School Monographs: Contributions in Physical Science, No. 1. Columbus, OH: The Ohio State University. pp. 87–88. Retrieved 31 January 2013. Moore thought that Theophrastus was really referring to asbestos. The color of the stone makes this unlikely, though its structure makes it less improbable, since some forms of decayed wood do have a fibrous structure like asbestos ... It is, however, unlikely that Theophrastus is alluding to asbestos, since the mineral does not occur in the locality mentioned ... It is much more probable that Theophrastus is referring to the well-known brown fibrous lignite. ^ Barbalace, Roberta C. (22 October 1995). "History of Asbestos". Environmentalchemistry.com. Retrieved 12 January 2010. ^ Maines, Rachel (2005). Asbestos and Fire: Technological Trade-offs and the Body at Risk. Rutgers University Press. p. 7. ISBN 978-0-8135-3575-3. ^ a b "University of Calgary". Iras.ucalgary.ca. 30 September 2001. Archived from the original on 5 November 2009. Retrieved 12 January 2010. ^ "Fantastically Wrong: The Legend of the Homicidal Fire-Proof Salamander". WIRED. Retrieved 3 May 2016. ^ "Science: Asbestos". Time. 29 November 1926. Archived from the original on 31 January 2011. Retrieved 11 January 2011. ^ Polo, Marco; A C. Moule; Paul Pelliot (1938). Marco Polo: the Description of the World: A.C. Moule & Paul Pelliot. G. Routledge & Sons. pp. 156–57. Retrieved 31 January 2013. ^ a b Chambers, Ephraim (1728). Cyclopædia. Retrieved 28 November 2016. ^ Eleftheratou, S. (2016). Acropolis museum guide. Acropolis Museum Editions. p. 258. ^ a b c Selikoff, Irving J. (1978). Asbestos and Disease. Elsevier. pp. 8–20. ISBN 9780323140072. ^ "Asbestos & Clydebank". Clydebank Asbestos Group. Archived from the original on 6 June 2014. ^ "OATS, FRANCIS of GOLANT". South African Who's Who 1916. November 2006. Archived from the original on 1 June 2016. Retrieved 6 June 2014. ^ Betts, John (May – June 2009). "The Minerals of New York City". Rocks & Mineral Magazine. 84 (3): 204–252. doi:10.3200/RMIN.84.3.204-223. Retrieved 21 April 2011. ^ Don, Andrew (1 May 2011) Asbestos: the hidden health hazard in millions of homes. The Guardian. ^ Morinaga, Kenji. "Asbestos in Japan" (PDF). European Conference 2003. Archived from the original (PDF) on 19 July 2011. Retrieved 12 January 2010. ^ Luus, K (2007). "Asbestos: Mining exposure, health effects and policy implications". McGill Journal of Medicine : MJM : An International Forum for the Advancement of Medical Sciences by Students. 10 (2): 121–6. PMC 2323486. PMID 18523609. ^ a b "The History of Asbestos in the UK – The story so far ... Asbestos uses and regulations timeline" (PDF). silverdell.plc.uk. 30 April 2012. Archived from the original (PDF) on 21 October 2013. ^ Selikoff, Irving J. (1978). Asbestos and Disease. Elsevier. pp. 20–32. ISBN 9780323140072. ^ a b Cooke, W.E. (26 July 1924). "FIBROSIS OF THE LUNGS DUE TO THE INHALATION OF ASBESTOS DUST". Br Med J. London: BMA. 2 (3317): 140–2, 147. doi:10.1136/bmj.2.3317.147. ISSN 0959-8138. PMC 2304688. PMID 20771679. ^ a b c Selikoff, Irving J.; Greenberg, Morris (20 February 1991). "A Landmark Case in Asbestosis" (PDF). JAMA. Chicago, Illinois: AMA. 265 (7): 898–901. doi:10.1001/jama.265.7.898. ISSN 0098-7484. PMID 1825122. Retrieved 20 April 2010. ^ Bartrip, P.W.J. (2001). The Way from Dusty Death: Turner and Newall and the Regulation of the British Asbestos Industry 1890s–1970. London: The Athlone Press. p. 12. ISBN 978-0-485-11573-4. ^ Bartrip, Peter (1998). "Too little, too late? The home office and the asbestos industry regulations, 1931". Med. Hist. London: The Wellcome Trust Centre for the History of Medicine at UCL. 42 (4): 421–438. doi:10.1017/s0025727300064334. ISSN 0025-7273. PMC 1044071. PMID 10505397. ^ Published as Report on the effects of asbestos dust on the lungs and dust suppression in the asbestos industry. Part I. Occurrence of pulmonary fibrosis and other pulmonary affections in asbestos workers. Part II. Processes giving rise to dust and methods for its suppression. London: HMSO, 1930. ^ "Classic papers in Public Health: Annual Report of the Chief Inspector of Factories for the Year 1947 by E.R.A. Merewether – The Pump Handle". scienceblogs.com. 21 October 2013. Retrieved 21 October 2013. ^ a b "What is asbestos?". American Cancer Society. Retrieved 12 January 2010. ^ Franck, Harold; Franck, Darren (2016). Forensic Engineering Fundamentals. Boca Raton FL: CRC Press. p. 103. ISBN 9781439878408. Retrieved 21 March 2019. ^ Hearst Magazines (July 1935). Popular Mechanics. Hearst Magazines. pp. 62–. ISSN 0032-4558. Retrieved 10 January 2012. ^ "NOHSC declares prohibition on use of chrysotile asbestos". Ascc.gov.au. 17 October 2001. Archived from the original on 7 June 2008. ^ "Asbestos Cement Pipes at Best Price in India". dir.indiamart.com. ^ Cigarette Filter Danger. Snopes.com. Retrieved 10 January 2012. ^ Otway, Helen (2005). "Unbelievable Random Facts". 1001 unbelievable Facts. Capella. p. 191. ISBN 978-1-84193-783-0. ^ 947 F. 2d 1201 – Corrosion Proof Fittings v. Environmental Protection Agency. Openjurist.org. Retrieved 10 January 2012. 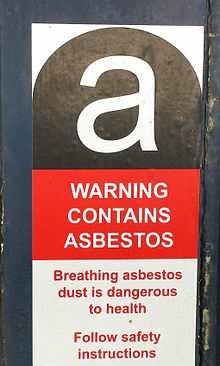 ^ Where can asbestos be found, Asbestos Surveying Ltd, Birmingham, UK, 2 08 2008. Retrieved 29 Dec 2008. ^ Artex website, Click the "Asbestos in Artex" button. ^ "Asbestos: The survey guide". www.hse.gov.uk. ^ Control of Asbestos Regulations 2006, Health and Safety Executive, London, UK, Undated. Retrieved 29 Dec 2008. ^ a b "Asbestos in the home booklet. Wrekin housing trust" (PDF). Retrieved 26 October 2010. ^ Asbestos Removal. Laws.sandwell.gov.uk (1 April 2005). Retrieved 10 January 2012. ^ a b Stephenson, John B. (20 June 2007). World Trade Center : preliminary observations on EPA's second program to address indoor contamination (GAO-07-806T) : testimony before the Subcommittee on Superfund and Environmental Health, U.S. Senate Committee on Environment and Public Works. Washington, D.C.: U.S. Government Accountability Office. ^ a b c Pilkington, Ed (11 November 2009). "9/11's delayed legacy: cancer for many of the rescue workers". The Guardian. London. Archived from the original on 12 May 2017. Retrieved 10 February 2010. ^ "EPA Asbestos Contamination In Vermiculite". Epa.gov. 28 June 2006. Archived from the original on 11 January 2010. Retrieved 12 January 2010. ^ Meeker, G.P (2003). "The Composition and Morphology of Amphiboles from the Rainy Creek Complex, Near Libby, Montana". American Mineralogist. 88 (11–12): 1955–1969. Bibcode:2003AmMin..88.1955M. doi:10.2138/am-2003-11-1239. ^ "Libby Asbestos – US EPA Region 8". Epa.gov. Archived from the original on 5 February 2010. Retrieved 12 January 2010. ^ "Risk Assessment – US EPA". Epa.gov. 22 December 2008. Retrieved 12 January 2010. ^ Dillner, Luisa (29 February 2016). "Is it safe to use talcum powder?". The Guardian. ISSN 0261-3077. Retrieved 3 April 2017. ^ "The Straight Dope: Is talcum powder asbestos?". www.straightdope.com. Retrieved 3 April 2017. ^ a b c "Major brands of kids' crayons contain asbestos, tests show". Seattle Post-Intelligencer. 23 May 2000. Archived from the original on 4 March 2012. ^ a b Schneider, Andrew; Smith, Carol (13 June 2000). "Crayon firms agree to stop using talc" (PDF). Seattle Post-Intelligencer. ^ McAteer, J. Davitt Assist. Secretary for Mine Safety and Health correspondence to Andrew Schneider of the Seattle Post-Intelligencer dated 14 June 2000 – copy obtainable through records archives MSHA. Van Orden, D., R. J. Lee: Weight Percent Compositional Analysis of Seven RTV Talc Samples. Analytical Report to R. T. Vanderbilt Company, Inc. 22 November 2000. Submitted to Public Comments Record – C. W. Jameson, National Toxicology Program, 10th ROC Nominations "Talc (containing asbestiform fibers)". 4 December 2000. Nord, G. L, S. W. Axen, R. P. Nolan: Mineralogy and Experimental Animal Studies of Tremolitic Talc. Environmental Sciences Laboratory, Brooklyn College, The City University of New York. Submitted to Public Comments Record – C. W. Jameson, National Toxicology Program, 10th ROC Nominations "Talc (containing asbestiform fibers)". 1 December 2000. Kelse, J. W.; Thompson, C. Sheldon (1989). "The Regulatory and Mineralogical Definitions of Asbestos and Their Impact on Amphibole Dust Analysis". AIHA Journal. 50 (11): 613–622. doi:10.1080/15298668991375245. Wylie, A.G. (2 June 2000) Report of Investigation. Analytical Report on RTV talc submitted to R. T. Vanderbilt Company, Inc. 13 February 1987 (Submitted to Public Comments Record – C. W. Jameson, National Toxicology Program, 10th ROC Nominations "Talc (containing asbestiform fibers)". Crane, D. (26 November 1986) Letter to Greg Piacitelli (NIOSH) describing the analytical findings of the Occupational Safety and Health Administration regarding R. T. Vanderbilt Talc (In OSHA Docket H-33-d and In Public Comments Record – C. W. Jameson, National Toxicology Program, 10th ROC Nominations – 2 June 2000). Crane, D. (12 June 2000) Background Information Regarding the Analysis of Industrial Talcs. Letter to the Consumer Product Safety Commission from the Occupational Safety and Health Administration. (Appended to CPSC Staff Report on "Asbestos in Children's Crayons" Aug. 2000). McCrone Associates – Atlanta Lab. : Report on the Analysis of Paint CLS-5067-1 and Mineral Filler CLS-N-439-1. To Unspecified Paint Company 23 September 1992. (Submitted to Public Comments Record – C. W. Jameson, National Toxicology Program, 10th ROC Nominations "Talc (containing asbestiform fibers)". 2 June 2000. Langer, A. M., Nolan, R. P. (November 2000) "Mineralogical Characterization of Vanderbilt Talc Specimens & Comparison of the 1976 Rohl Talc Report to NIOSH and Analysis Performed in 1988". In Public Comments – Nat'l Toxicology Program 10th ROC review. W. Jameson NIEHS MED EC-14, 79 Alexander Drive Research Triangle Park, NC "Talc (containing asbestiform fibers)". United States Department of the Interior: Selected Silicate Minerals and Their Asbestiform Varieties by W. J. Campbell, et al. (Bureau of Mines Information Circular, I. C. 8751). Washington, D.C.: Dept. of the Interior, Bureau of Mines. (1977). Stille, WT; Tabershaw, IR (1982). "The mortality experience of upstate New York talc workers". Journal of Occupational Medicine. 24 (6): 480–4. PMID 7097380. Lamm, SH; Levine, MS; Starr, JA; Tirey, SL (1988). "Analysis of excess lung cancer risk in short-term employees". American Journal of Epidemiology. 127 (6): 1202–9. doi:10.1093/oxfordjournals.aje.a114913. PMID 3369419. Gamble, JF (1993). "A nested case control study of lung cancer among New York talc workers". International Archives of Occupational and Environmental Health. 64 (6): 449–56. doi:10.1007/BF00517952. PMID 8458662. ^ Dement, JM; Brown, DP (1982). "Occupational exposure to talc containing asbestos". American Industrial Hygiene Association Journal. 43 (6): A24–5. PMID 7113917. ^ Hull, M. J.; Abraham, J. L.; Case, B. W. (2002). "Mesothelioma among Workers in Asbestiform Fiber-Bearing Talc Mines in New York State". Annals of Occupational Hygiene. 46: 132–135. doi:10.1093/annhyg/46.suppl_1.132. ^ Bellon, Tina. "Jury orders J&J to pay $4.7 billion in Missouri asbestos cancer case". U.S. Retrieved 13 July 2018. ^ "Asbestos, CAS No. 1332-21-4" (PDF). Archived from the original (PDF) on 29 April 2011. ^ Berman, D Wayne; Crump, Kenny S (2003). Final draft:technical support document for a protocol to assess asbestos-related risk. Washington DC: U.S. Environmental Protection Agency. p. 474. ^ a b "Asbestos – History and Uses". Wisconsin Department of Natural Resources. 31 August 2007. Archived from the original on 28 December 2007. ^ Flanagan, Daniel M. (31 January 2018). "Mineral Commodity Summaries 2018" (pdf). Reston, Virginia: U.S. Geological Survey. p. 27. Retrieved 22 March 2019. ^ "Asbestos" (PDF). U.S. Geological Survey Mineral Resources Program. January 2016. Retrieved 25 August 2016. ^ Tsujimura, Tatsuya (18 November 2014). "Japanese docs trying to stop all asbestos use in Asia". The Japan Times. Tokyo. Retrieved 21 March 2019. ^ "Asbestos" (PDF). U.S. Geological Survey Mineral Resources Program. January 2010. Retrieved 25 August 2016. ^ Straif, K; Benbrahim-Tallaa, L; Baan, R; Grosse, Y; Secretan, B; El Ghissassi, F; Bouvard, V; Guha, N; Freeman, C; Galichet, L; Cogliano, V; WHO International Agency for Research on Cancer Monograph Working Group (2009). "A review of human carcinogens—Part C: Metals, arsenic, dusts, and fibres" (PDF). The Lancet. Oncology. 10 (5): 453–4. doi:10.1016/S1470-2045(09)70134-2. PMID 19418618. ^ Kanarek, M. S. (2011). "Mesothelioma from Chrysotile Asbestos: Update". Annals of Epidemiology. 21 (9): 688–97. doi:10.1016/j.annepidem.2011.05.010. PMID 21820631. ^ Marbbn, C.A. (2009). "Asbestos Risk Assessment". The Journal of Undergraduate Biological Studies: 12–24. ^ "Investigation of the chrysotile fibres in an asbestos cement sample (2006) - HSL/2007/11], p.26 onward" (PDF). ^ ToxFAQs for Asbestos[dead link], Agency for Toxic Substances and Disease Registry. ^ "Mesothelioma in Australia". Asbestos.com. Retrieved 13 December 2012. ^ "National Health and Medical Research Council". Retrieved 13 December 2012. ^ "Building unions seek laws to clear asbestos". The Sydney Morning Herald. SydenyMorningHerald.com. Retrieved 2 February 2013. ^ "Unions warn on meter board asbestos". Australian Associated Press. Retrieved 10 August 2013. ^ "All buildings should be cleared of asbestos by 2030 to save future generations". ACTU. 16 September 2011. Archived from the original on 13 April 2014. ^ Asbestos use banned on all products from this month. Etoday.co.kr. Retrieved on 2015-10-17. ^ Smartt, Pamela (2004). "Mortality, morbidity, and asbestosis in New Zealand: the hidden legacy of asbestos exposure". The New Zealand Medical Journal. 117 (1205): U1153. PMID 15570336. ^ "Govt moves on asbestos-containing products". The Beehive. Retrieved 16 June 2016. ^ "National Library of New Zealand". Grey River Argus, Volume LVII, Issue 9871, 8 January 1898, Page 4. ^ Blair, AK (1994). The Cobb : the history of the Cobb River hydro-electric power scheme. Christchurch, New Zealand: Cadsonbury Publications, Christchurch, 1998. pp. 67–69, 71–72, 100–101. ISBN 0477016995. ^ Kim, Hyoung Ryoul (12 June 2009). "Overview of Asbestos Issues in Korea". J Korean Med Sci. 3. 24 (3): 363–367. doi:10.3346/jkms.2009.24.3.363. PMC 2698178. PMID 19543418. ^ "Fiber Glass: A Carcinogen That's Everywhere". Rachel's News. Environmental Research Foundation. 31 May 1995. ^ Marsh, G. M.; Buchanich, J. M.; Youk, A. O. (2011). "Fiber glass exposure and human respiratory system cancer risk: Lack of evidence persists since 2001 IARC re-evaluation". Regulatory Toxicology and Pharmacology. 60 (1): 84–92. doi:10.1016/j.yrtph.2011.02.009. PMID 21345360. ^ Dixit, B., "Performance of Protective Clothing: Development and Testing of Asbestos Substitutes," Performance of Protective Clothing, ASTM STP 900, R. L. Barker and G. C. Coletta, Eds., American Society for Testing and Materials, Philadelphia, 1986, pp. 446–460 ISBN 0-8031-0461-8. ^ Gualtieri, A. F.; Tartaglia, A. (2000). "Thermal decomposition of asbestos and recycling in traditional ceramics". Journal of the European Ceramic Society. 20 (9): 1409–1418. doi:10.1016/S0955-2219(99)00290-3. ^ Leonelli, C.; Veronesi, P.; Boccaccini, D.; Rivasi, M.; Barbieri, L.; Andreola, F.; Lancellotti, I.; Rabitti, D.; Pellacani, G. (2006). "Microwave thermal inertisation of asbestos containing waste and its recycling in traditional ceramics". Journal of Hazardous Materials. 135 (1–3): 149–55. doi:10.1016/j.jhazmat.2005.11.035. PMID 16406335. ^ Francesco Turci; Maura Tomatis; Stefano Mantegna; Giancarlo Cravotto; Bice Fubini (2007). "The combination of oxalic acid with power ultrasound fully degrades chrysotile asbestos fibres". Journal of Environmental Monitoring (10): 1064–1066. Castleman, Barry I. (1996). Asbestos: Medical and Legal Aspects. Englewood Cliffs, NJ: Aspen Publishers. ISBN 978-0-7355-5260-9. George B. Guthrie and Brooke T. Mossman, editors, Health Effects of Mineral Dusts, Mineralogical Society of America Reviews in Mineralogy v. 28, 584 pages (1993) ISBN 0-939950-33-2. Tweedale, Geoffrey (2000). Magic Mineral to Killer Dust Turner & Newall and the Asbestos Hazard. Oxford Univ. Press. p. 336. ISBN 978-0-19-829690-4. Asbestos general article and chrysotile specifically: comprehensive coverage of all aspects of chemistry, biological interactions, destruction, and social/clinical scientific knowledge related to Asbestos, on the Toxicology Data Network, with full library of cites on many aspects and sub-topics].